This mysterious creature came to visit me the eve before Thanksgiving. Isn’t it amazing? As I snapped this close-up, she actually turned her head inquisitively, as if sizing me up. It’s large eyes and triangular shaped head then shifted and looked at me from the other direction. I stood motionless for a moment. What an intelligent, thoughtful, surprise visitor! I was baking a pie, the night before Thanksgiving, and she walked, easy as you please, right past my strawberry-apple pie. She seemed to know where she was going. Very determined to say the least. By the time she reached my fork, I took the close-up picture and then found a helper to put the insect in the back yard—where she’d be less likely to get stepped on or eaten by a playful pet. “Excellent hunters with an efficient attack strategy the praying mantis always knows the right moment for attack and for retreat. Time in the linear sense is irrelevant to the mantis. They move according to their inner instincts and remind us to do the same. Moving effortlessly between worlds the mantis is associated with time travel. They help us break out of linear time and move according to our personal bio rhythms. 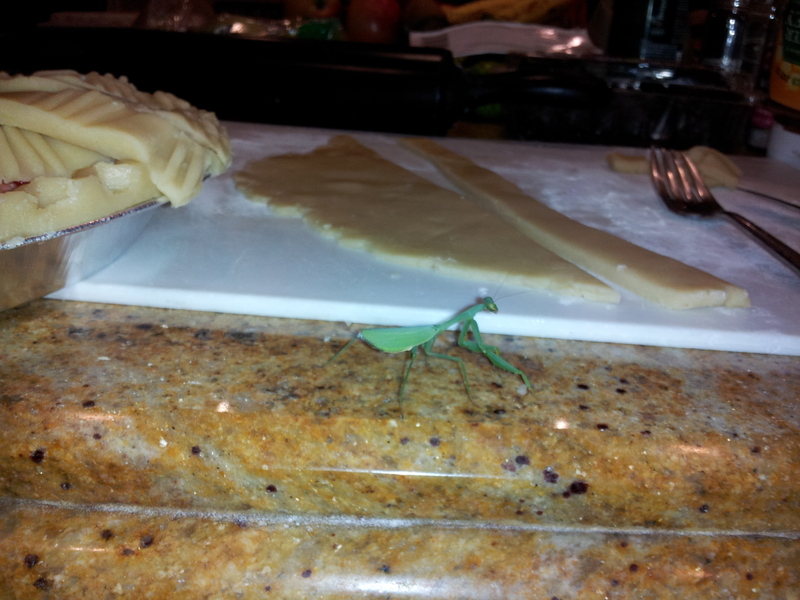 If the mantis can remain motionless for long periods of time, in order to blend into its environment, what possessed this mantis to walk right past me as I’m putting together a pie and step up onto my fork like that? Well, apparently, legend has it that if a praying mantis comes to you in your house, it is a good sign of things to come. But others say it could be an omen or the visit is trying to force you to re-evaluate issues in your life. Very intriguing and appropriate questions for me at this point in my life. Perhaps in yours, too? I’d like to think that seeing this praying mantis so close-up was a good sign of things to come. Perhaps it was a wake-up call—or a call to look more closely at situations or issues in my life. I don’t know about its particular message, but I like the qualities that a mantis represents: the power of stillness and female warrior energy, especially. I could use a little female warrior energy! Sometimes it’s still hard for me to ask for what I need, or to quickly recognize when a situation isn’t healthy. I’m growing and learning each day to shed my co-dependent ways. This holiday season I’m striving to find more peace and stillness and less stressful situations for my boys. Incorporating some praying mantis tactics such as staying still, observing situations calmly and listening to my inner instincts, can only be good additions to my life. How about yours? This entry was posted in Dating/Relationships, Health/Wellbeing, Photography and tagged Animalia, Barack Obama, Biology, Claude, Close-up, Family, Flora and Fauna, Holidays, Is a praying mantis sending you a message?, Life, lowering stress, Mantis, Nature, Ootheca, praying mantis, Raymond Buckland, re-evaluating situations in your life, symbolism of the praying mantis, taking stock, Thanksgiving, Time travel, when a praying mantis appears in your house. Bookmark the permalink. I ran across your blog tonight after googling “praying mantis omen”…(interesting to know what people Google!) anyway, I was visited by a praying mantis today & it really freaked me out. I went outside to get my mail & as I was opening my door I saw the praying mantis on my door frame. It turned it’s head and like right at me (like person – it was freaky!! )I screamed bc it scared me & I ran inside! I have been thinking about it ever since & wondering what it means, if anything. I’m also hoping it chat get inside bc I’m terrified of it. Your post was very relatable. Thanks so much for sharing! white one would indicate purity or the Holy Spirit….. a good omen !!! !….For me praying to Jesus is easier now, and I know I’m a winner with him…..
I’m so glad I found this, I was woken up by one last night, it was so weird, it made alotta of noise in my room, and as a woman living alone I got scared but still had the courage to switch on the light and investigate, and it came straight to my pillow, I got scared for a minute, but not once did I think of killing it cuz I felt a peaceful presence in my room, it was so wierd but awesome… And I wanted to talk to it, but I Thot that was crazy, but there was something about it that was just so peaceful… And well I did’nt remove it from my pillow, and it chilled for a while, so I ended up passing out on the other side of the bed….. And I remember waking up around midnight, and it was still there but it looked like it was asleep, so I went back to my sleep, but wen my alarm went around 5am, it was gone….but i’v been curious about this whole thing ever since…… But this stories are so amazing. yesterday I met up with my father for the first time in years. I haven’t had much to do with him since he moved out and left my mother and I when I was 6. I am now 21, and decided I wanted to get to know my father a little better. We met for a drink which went well so we decided to go back to his house. We were going out to have a smoke when I noticed on the screen door, a pray mantis (a male I believe). I didn’t think much about it at this point. I soon left my father’s and headed back to my boy friends where I live. As I entered the screen door I noticed another pray mantis( also appeared to be male). I have been having some issues with my boy friend lately. I am not sure if this is a sign or something ? I’ve been struggling a lot lately. Got laid off in march because the company I worked for went out of business, my bf of 8 yes and I broke up because he had a terrible habit of lying and cheating, and I recently discovered that in 2 wks my unemployment will run out and the state is not offering any extensions. I’ve been seeking adequate employment for months to no avail. Needless to say, I’ve been very depressed terrified that my kids and I will soon be homeless and have no money. This morning as I was reading and deepening my spirituality, I glanced up to my large living room window and notices a praying mantis. I walked up to the window to get a closer look. It looked at me and flew away. I walked to the front door and opened it to find the praying mantis was on the screen door. I didn’t want to scare it away so I closed the door and started researching the significance. I had a sudden desire to photograph it so grabbed my phone and opened the door. It was gone. I stepped out looking for it but couldn’t find it anywhere. I can’t help but believe he had a message for me. What, idk. Does anyone have any ideas? Wow Charlie, SO much for you to be going through. Hang in there. Maybe the mantis is sending a message of hope: that miracles/opportunities are just outside your door, outside your window, waiting for you to open them and step through the fear. Wow, how wonderful! You know, my gut reaction is to say that the praying mantis sighting was in relation to your love for your ex. I say this because the mantis was on your back car window. When you drive, you look into your rearview mirror often to see through the back window, to see what’s behind you and what may be approaching so you can keep driving safely forward. Our past is inextricably linked with our present and future. We must look into our past, see where we’ve been, what lessons we can learn, in order to safely drive forward, to successfully navigate to a future location that is just right for our continued growth and happiness.. So it’s your time to look back, look into that back window to your relationship with your ex. Pause and ask yourself if there is a specific lesson that you still need to learn? Perhaps that is all that it is. Or, perhaps it’s more than that and it’s time to turn around and reach out to her and try to rekindle or make amends? So take some time to reflect on your past relationship, what you adore about this person, what your role was in your break-up, what gratitude you have for any growth in that relationship and whether you are better off moving forward and trying to rekindle? How beautiful! Thanks for reading and sharing! I have had 3 encouters with these creatures in less than a week. All were found inside my house upstairs in my bedroom, one of which were right where we lay our heads on the window sill and on another on a pillow in the same window. With this being said I am scared to death of insects,bugs,pets, or animals of any sort even the fish in a tank. There are several things going on in my life right now so i just want to know,why are these creatures coming to vist me? Is there a logical explanation for this? Hmmm, Carol, that’s ripe for a lot of crappy innuendo! 🙂 But, like you, I believe signs are everywhere. Here’s one interpretation: Before you pick up and throw out the typical crap you’re dealing with in your daily life….maybe take a few moments to think. Is your day in and day out life having you shovel crap? Do you need to re-evaluate your relationships? Are you 50% responsible for all that is happening and are you needing to reconsider any relationship turmoil or recent judgements you’ve made about others that may have exhausted you? Can you shift your perspective and try to understand them before trying to be understood? Pause before throwing out or walking away? Thanks for reading and sharing! I love how people encounter praying mantis’ in the most intriguing ways! Hello. As I’m writting this a praying mantis was on my screen door and now is sitting on the door seal above the door. I grab my iPad and took a few pics of it. I felt his visit means something. I didn’t know if it’s good or bad, but I wanted to know. I was in a five year relationship that ended ten months ago. It was not a good relationship. During one of our off periods, I met another man and he had me at hello. Things didn’t work out for me and the other man. After two and a half years… the man reenters my life. Two nights ago, we had a lovely time together. So, I’m wondering if this little creature is trying to tell me something. Well my visitor has been at my house for 3 days now he’s hanging around on my front door frame, not sure what all this means however as long as it’s a good thing he’s here I don’t mind. Thanks for your research. I’ll pray he doesn’t ever leave. Also today marks 2 yrs that my mother passed away so I wondered if this visitor is here because of her. Not sure who knows right anything is possible! Yes, anything is possible!! How amazing. Thanks for sharing. Ive been having some issues with my husband pretty bad ones too, and earlier today during a home inspection for work, i was standing outside of the home and out of no where i felt something tickle my leg as if it was like a tag on a shirt or so, i look down and a praying mantis was on me. At first i kicked it off and then started staring at it. i took some cool pictures and it was just staring at me with those big eyes. First i was grossed out but the more i stare at it the more peaceful and beautiful it looked. So now im here reading about them. That’s amazing. Mine came and kept coming back during a particularly challenging time in my life too! I love their big peaceful eyes and how they don’t run away, but stare at you, as if trying to send a message. Thanks for sharing! On Sept 21 2015 on a camping trip in our RV my 9 yr old Great Dane Prada, fell ill and passed unexpectedly hrs later. I have been emotionally devastated by this blind side. I’ve had uncontrollable crying and depression. On Oct 27 , I entered our RV for the first time since she passed. I was crying from all my memories of her . I was in the rear bedroom and looked down , I thought it was a clump of grass or stick. I pushed it with my foot into the rear bathroom. It was a petrified Praying Mantis in perfect form. The praying mantis somehow got in the RV during that last camping trip. I’m so sorry for your loss. I’m still sad over losing my weimaraner years ago. It’s so hard. I have no idea if there is a meaning with this sighting or not. But they are such amazing creatures. Perhaps a witness to your pain? I was sitting at my computer when I heard something fly in the window. I didn’t see it. I had just received a call of someone close to me (in childhoods) passing. I also just put my notice in at work due to a crazy boss. Earlier this morning, I had a fight with my boyfriend. I also came home early because I had found out a medical issue which I thought was resolved, had returned. Anyways, I didn’t see what had flown in but a moment later it was tangled in my hair! I screamed & did everything in my power to remove it from my head. I still had no clue what it was flying around in there, but it fell out. I looked around & saw nothing. Moments later, it was crawling on my leg. In sheer panic I smacked it with my flip flop, injuring it. It continued to crawl & became very still. At this time, I snapped a picture (not knowing what it was) and I had a moment of purity where I apologized for hurting him & waited for my brave daughter to come home to release him back outside. Is it a bad omen to hurt a mantis? I have enough going on in my life. Is it a sign? This morning I had my second visit in a week. I had to google the meaning as I thought it odd as well. Your post was much welcomed as I myself am sitting at a cross roads with my career at the moment. Yes, I know the answer but the executing of an entire career change at 43 with a young child at school is something I am not so sure about. The praying mantis does indeed signify a strong female, a warrior and I suppose this is my answer. I have to close my eyes and persevere. Thank you for this post. Nearly 6 years ago my partner of 22years died quite suddenly , only one month after being diagnosed with acute myeloid leukemia. On the evening of her death and for all the days leading up to her funeral my double ranchslider doors in my bedroom were covered in praying mantis. It was like a green curtain clinging to the outside on the window !! They were the most prolific on the eve of her death and lessened as the days went on. I read up about the spiritual significance of this in Barry Brailsfords’ book. This gave me lots of insight and comfort. Now the time of year was April 10th and in New Zealand …..this is coming into our Autumn. Last week I was talking with a friend in my home and we were reminiscing about my partners death and I told her the story of the praying mantis. She sat there staring at me as if she’d seen a ghost and then pointed to my shoulder…..sitting there perched on my left shoulder near my neck was a praying mantis ! It was quite still and it allowed me to carefully pick it up and take it outside. Now I had no windows open ….it is the middle of summer in NZ and I have not seen any other praying mantis around. I don’t even know if they come out in the summer and actually live long enough to take them to early April ? I’d like to think my soul mate had visited from the other side…..manifesting herself in this form. I believe in in this and would like to have your ‘take’ on this amazing happening ! Wow, Lillian, what a story! How amazing and how wonderful too! You know, I’m not a mantis expert in the least! I did look up their mating season in NZ and it seems that it runs 3 weeks mid-March. Apparently the mantis have a short life span too. It’s just too much of a coincidence for a mantis to appear on your shoulder the moment you are telling your friend about all of the mantis on your doors after your partner died. I’m sure you haven’t had many mantis appear on your shoulder like that either—as if trying to be part of the conversation or to listen in. I’d say your partner sent you a message: a message of hope and of female, goddess energy, power, grace, friendship, love. Thank you so much for sharing your story! Calvary Greetings in Jesus name,. My name is Joyce. I just had a dream where I saw a big praying mantis!.. I was scared! It came towards me, open its mouth twice, First opening of its mouth, I saw color blue and on the second opening of its mouth I saw color purple. Joyce! WOW! Ok, so are you going through a major transition? Are you finding your voice? Are you in situations where you are learning to hold back what you want to say? Are you having lucid dreams (besides this one lol!) Are you sensing others thoughts, feelings, intuiting events? Here’s why I am saying all of this. You, my dear, are tapping into your throat and 3rd eye chakras. Maybe this is a bit too much for you? But hear me out. The throat chakra is represented by the color blue. When in balance, you speak your truth with grace & kindness and you bite your tongue if what you want to say is not kind, not true, not needed to be said by you or not needed to be said right now. When your throat chakra is out of balance, you vomit nervous chatter. You often project your fears on others with your words. You say controlling things, manipulating things. It is out of control when you are ruled by fear. If it is in under-use, you never speak your mind. Also ruled by fear when not utilized, you are silent when your feelings are deeply hurt. You are silent when you need to show the world what you can do. When this chakra is not in tune, you feel as if you are teetering out of control and are saying things before you think about them, or that you are invisible and not appreciated or supported. So, your 3rd eye chakra, my favorite, is represented by the color purple, it’s scent lavender. It is your center for intuition. If you sense that someone means you harm, you listen. It is the inner voice that lets you know when something or someone is good for you or not. It leads you to your destiny, your joyful career, your friends who are like family. And the Praying Mantis is the female warrior, with Goddess energy…she is telling you to listen to your intuition. It will guide you to either speak up, or to thoughtfully try to understand before being understood with those you speak with. Hi Sonia! Sorry for the lag in response, crazy week. WOW I love hearing these stories! I am embracing my inner child too. I even have a pic of me when I was little in my room to remind me to find child-like joy in little things every day. I try. Aren’t these creatures marvelous? I am convinced that the one who visited me on that sad and frustrating Thanksgiving was channeling my mom who has Alzheimer’s and can’t speak…trying to tell me to listen to my inner voice. I knew I was in a bad situation that wasn’t for my highest good. I needed to listen to that voice and to let go so I could find my own path. Thank you for sharing! And let me know if you see another! Today is valentine’s day, a year and three days ago I signed consent forms for my divorce after 11 years of been married to a man who cheated on me, I moved back home and fixed up the house as best I could, my life has been a whirl wind and I’ve paid no attention to what I want I’ve focused on renovations and moving. Today as I was hanging my laundry up I found a praying mantis on my washing line, it turned to look at me and I just stared at. Right now I’m wondering what does this mean, since the last time I seen one was two years ago but never took notice of it. Hi all for this great insights. I am currently going through an intensely emotional karmic relationship with a man, which has been all-consuming in my life, and been desperate to get my heart to follow what my head is saying ! (which is to get out before it gets worse. This morning I noticed a little nest on my window blinds, and when I went closer it was a nest of baby praying mantis (hundreds of them!) just crawling out! A most beautiful sight! But I wonder what message a whole nest of newborns are sending me? Hi. I was going through a spiritual time in my life, I felt enlightened. One day as I was driving, I spotted a prey mantis on the corner of my front car good. 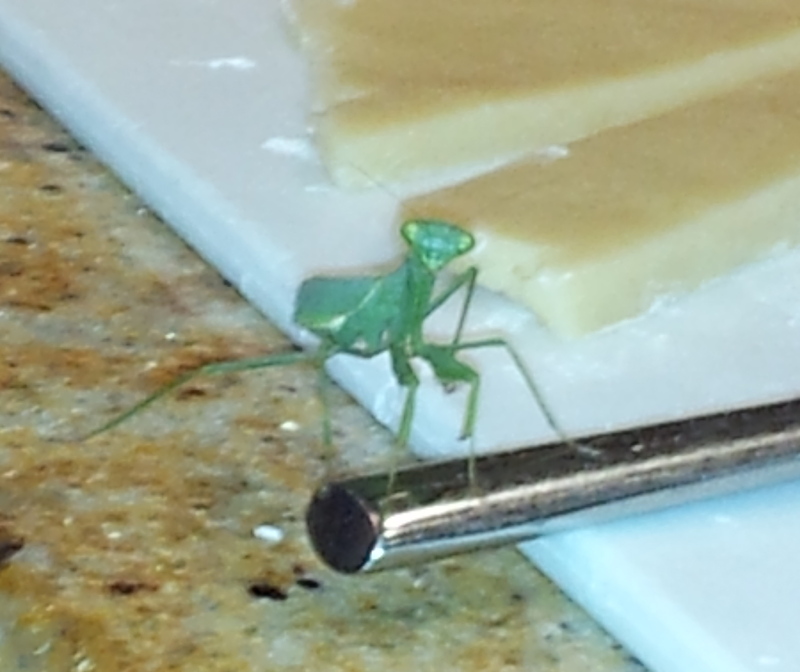 It was a random event in my life, a wierd place to spot a prey mantis. Was this a sign?. After my first encounter with my prey friend, they show up a lot now. I really want to find out what this means. As I am writing this message, their are two prey mantis in my room, just chilling on the ceiling. Today I spotted a female prey mantis and a male prey mantis mateing outside. Also spotted another one outside, chilling on a outdoor ladder. I notice that only male prey mantis are found in my house, and have spotted two female preymantis since the first prey mantis invasion. The two prey mantis in my room, are dark black beneathe the wings, others I’ve seen are light beneathe the wings. What doe’s this mean?. Wow Lucky, thanks for checking in! I don’t know what it means definitively, but as an intuitive yogi, I’m feeling sexual energy with you. Maybe you are re-inventing yourself spiritually, but maybe you are also creating a vibration to attract your soul mate. If you are re-considering past loves or thinking about mistakes, it would be natural for the different male and female mantis sightings. Everyone hears how violent their matings can be, but not always. Males aren’t always killed, from what I read. They are really powerful and silent and still and magical. Find your stillness and see what lights up inside you and you’ll likely be lead to what you desire or what you’re dreaming of. Lots of Light to you. One night I got up to get a drink in the kitchen. As I turned to leave I felt something land on my head. I swished it away and it flew off into the family room. It took me awhile to work out what it was. I thanked it for the message it brings and then allowed it passage out of my front door. It did not leave. I returned to bed. The next morning I woke to find the mantis which I thought at the time was a stick insect was gone. Later while in the bathroom the mantis shows himself on the top of the shower screen. He has been in that room ever since. The last two weeks I think. My life right now revolves around emotional repair for my 5 boys and myself. Amazing it stays in the most watery room in the house. I loved reading all the posts up on this. It is truly amazing how animal spirits work. Thanks for starting all this Laura. Oh wow Kate! Sorry for the late reply, I was away…Good luck with all the work and focus on your boys. I get that, but you have FIVE? That’s amazing. I think the mantis is amazed by you and your strength and is reminding you daily that you are worthy and deserving and that anyone would be LUCKY to be around you everyday. Love & Light!!! Not sure Charles. Sorry for the late reply! I tried to reply via my cell phone and it must not have sent! Go see a doctor. Maybe you are having issues with vision? Equilibrium balance issues? I’ll say a prayer for you. Let me know how you are! Hey Julie-Anne, Don’t stress! To me, it’s just a sign that you are struggling in shaky waters, trying to find your roots. It’s hard to reach for your dreams if you feel as if you are in quick sand or in a turbulent sea, you know? Take some yoga breaths. Five to ten deep breaths. Breath in to the count of five, allow your lungs to fill completely. Exhale via your nose and make a little vibration in the back of your throat, like you are trying to fog up a mirror with your mouth closed. Count to six when you exhale. Do this again, listening to the sound of your breath, like an ocean wave. Imagine that with every inhale the Universe is filling you with confidence and safety and trust. Exhale the doubt, the panic, the fear. Keep doing this, maybe up to ten times. The Universe has your back. This mantis was struggling to find solid ground. Maybe clinging to the wrong places. It could be a metaphor for something going on in your life? As everyone else here I’ve been visited by a praying mantis 3 times this week. The first time was in my backyard after coming home from eating and I noticed it right by my foot. I told my bf and told him not to kill it because they are protected in the state where I live. I didn’t think anything of it and went inside. Three days ago it returned again but this time it was in my dining room while I was serving my kids supper. I called my bf and he took it outside. Now this evening after eating supper I was in the living with the kids and it was sitting right on my TV stand hanging out! I yet again set it outside. IDK what the meaning of this is but the praying mantis is very insistent. This morning getting my kids in the car, on my way to take my oldest daughter to school I saw a praying mantis at the end of the left side of my car close to my oldest daughters side, where she always sits. I had to warn her about it as she is terrified of insects and they are not a smaller insect so of course she was very nervous she wouldn’t go near that side. I had to get my infant son in his carseat which is right in the middle and it ran to the other side after I looked at it and walked towards it. As I put my 3 year old daughter on the right side it came back to the left side but now at the bottom of my tire after my oldest daughter jumped in very fearful. I had to grab a straw to try to move it as I did not want it to be squashed as I reversed. This is the second time I have found a praying mantis on the rear side of my car, last time it was on the top of my rear tire. I’ve been grieving the loss of my first husband, (my oldest daughters father we were divorced by church when he passed and I was with my now husband) its now been three years and I’m not sure if it is his spirit but sometimes I believe so because it was the exact occurrence the first time where I was on my way to taking my oldest daughter to school she’ll be 8 in two weeks. I’m not sure what the praying mantis is trying to speak to me but I thought I might ask for your insight. Wow, my first instinct is to say this, from your first husband: It’s okay to leave me behind. Move forward, move on. I see you holding on to me, let go. Only if you reverse, will you run over me again and again. I’m ready to let go of the back wheels and watch you cruise forward on your journey. It’s ok. Thank you for getting in touch and for sharing Vanessa. I feel that you are very deeply loved. Monique I,m so lucky to have 5 praying Montis visiting me these month 4 in my back yard I when to my cabin last night the fifth one was in my scoring back door love them and all different colors !!! Three praying many uses came to me and my boyfriend tonight as we were outside sitting in our tent. I’ve been told that when there is more than one that comes go you it has a completely different meaning. What meaning does this hold and does it go for both of us ? I recently suffered a miscarriage and have been wondering whether or not my husband and I should try again. In addition, I am at a crossroad work wise wondering should leave my current position and apply for a new position in the same company. I walked in my office only to find a Praying Mantis outside of my office window. It was there from the morning until the evening when I left work. I didn’t know anything about Praying Mantis until today. What does this mean? WOW MysticDreamer! What a story. Thank you for sharing. First, my heart goes out to you and your neighbors trying to hold on to your homes. That sounds frightening. You are such a light to help the seniors. So, about your double mantis visit…I’m not sure how to respond. One is holding on within the Web of the structure of your house. The other flies into the open door. Maybe symbolic, of holding on too tight and getting tangled in that web of fear. The other has an open door, symbolic of new opportunities, open to what is new, and being able to fly into that. What can you be open to? Are there new possibilities you need to consider, to look at, to allow yourself to be open to? Good luck!! Let me know what happens. I got home from work yesterday and started my daily home routine. My 80 year old mother lives with me. She is very sick. My home life feels like a prison sometimes. My spouse and I have not spoken to each other for about two weeks. We are never in the same room at the same time. And he only comes to bed when I’m all ready sleeping. With that said, I took my dogs out to my backyard and as soon as I stepped out I saw a mantis sitting very still on my deck railing. I’m not afraid of animals, I love them and it disturbs me to hear of abuse against any animal. Went to get a close look at the mantis, and the face was incredibly human. I called my daughter out so she could witness this visit. She was also amazed at the likeness of its face to that of a human. I can tell you that since I saw the mantis a felt a calmness come over me and also a strong urge to cry and let it all out. The mantis stayed all night on my deck, has not moved. This morning before I left for work I decided to check and sure enough is still there! I hope is there when I get home. I kind of know in my heart that the message is to let go angry feelings and to appreciate my family and life. But why is the mantis still on my deck? Am I getting the wrong message? I woke the other night to get a drink of water, when I came back to bed I noticed a praying mantis on my other pillow, it just stared at me, I couldn’t work out how it got in the house let alone my pillow! I carefully picked it up and put it on a plant outside, no it didn’t want to go at first but it did. I have no idea why this happened and I do feel that it was something spiritual. Hi A praying Mantis appeared on Saturday 4/15 Easter time, in my bacony do not know from where, i am in a high floor and helped her to get in one of my plants and she did by going through my hand inside the plant, gave her water, and had her for 3 days. Today Tuesday 4/18 I woke up and saw her dead. I was shocked and am sad.Do not know what happened. Is this a message of tragedy or sth coming in my path? I feel heratbroken. Maybe I did sth wrong or put her in a wrong plant. I put her in my male rude plant.So she could get high in thr sticks. Should I burry her? Im an empath and my level of consciousness is inthe 7th dimenssion. Very spiritual woman. I know Mantis are wisdom and good luck but she died and it freaks me.I already had too many suffering and deaths. Trying to heal by Gods strngth that gives me every day. So should I see this death of the Mantis as a future tragedy message? Wow this wonderful to know about praying mantis.I was sitting in a car with my friend my 14yrs old daughter came screening saying there is something by the door.We quickly rushed to the house , we find praying mantis,as am speaking it has been going all over the house walls now is sitting in the fridge door quietly.Last night I was hurt, I prayed asking God to take control of the situation.Reading about praying mantis on Google gives me inner Peace. Sorry she was screeming. It will take time to be Ohk, but i know God is INCONTROL of the situation It was never easy to be a woman. We go through a lot of hurts but we do pull through.